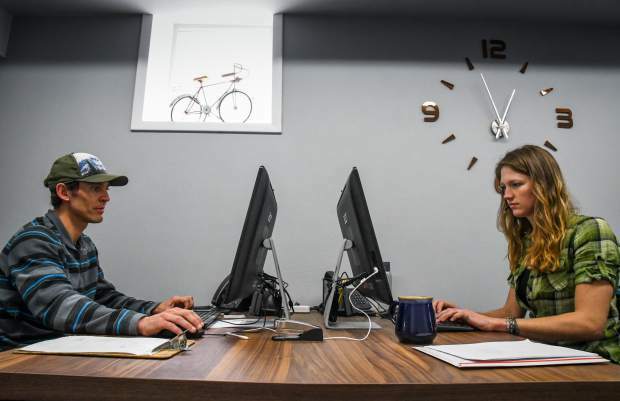 Logan Bartek and Jenn Cleary are part of the behind-the-scenes crew working to make sure the launch of the new Hanging Lake Trail reservation system is squared away and ready to go at 10 a.m. Monday. As of 10 a.m. Monday, anyone can reserve a spot on a shuttle to Hanging Lake or purchase a reservation to bike to the immensely popular trail in Glenwood Canyon. Both reservation types cost $12 during peak season, but during April, the price for a bike reservation is $9.50. The new reservation system through Visit Glenwood will be a drastic change from the unregulated, first-come-first-serve system. The Forest Service launched efforts to curb the potentially devastating effects of Hanging Lake’s massive popularity after 2017, when 184,000 people visited the lake in a single year, with as many as 1,200 people on the trail per day during the peak summer months. Starting May 1, visitors will be capped at 615 per day year round, and during peak summer months, hikers will be staggered to avoid congestion on the trail. Offseason reservations, between November and April, will cost $10 per person, and parking at the trailhead will reopen. The city of Glenwood Springs awarded the contract to H2O Ventures — a partnership between Glenwood Adventure Co., Adventure Office and Peak 1 Express — in February, and since then the city, the U.S. Forest Service, the Glenwood Chamber and Resort Association and other stakeholders have been meeting regularly, sometimes several times a week, to ready the new system. Ken Murphy, partner at Glenwood Adventure Company and one of the main leaders of H2O, said it’s been essential to stay flexible as they build the website back end and iron out the messaging details. H2O has a phone bank in the back room of Glenwood Adventure Co., where staff were going coming through the details for today’s launch. Murphy said he looks forward to breathing “a sigh of relief” this afternoon if things are going smoothly, but he won’t have long to rest before working out the final details for the welcome center, shuttle system and other operational concerns. But the most important service will be the chance to educate the customers. Up until now, a visitor to the lake could arrive and speak with no one but the other people on the trail. Starting in May, there will be at least five points of contact, each a chance to educate the user on how to best enjoy the world-famous site and abide by “leave no trace” principles. Hiring new workers, especially seasonal employees, can be a struggle in the region, but Murphy said people are excited to be a part of improving the Hanging Lake experience and protecting the unique treasure. Some commenters leave statements that criticize the cost, and say they won’t visit the trail due to the reservation system. Neidert said she responds kindly, thanking the commenter for their thoughts, and then explains the reasons for implementing the reservation-management system and fees. Some have raised concerns that companies providing existing services for Hanging Lake tourists will have a challenge ahead. Patrick Drake, owner of Canyon Bikes, has worked with H2O and the city over the past several weeks to address some concerns about the future of his business. Canyon Bikes, as well as Sunlight Ski and Bike and Glenwood Adventure Co., sell Hanging Lake tours that include bike rentals and shuttle service to Grizzly Creek so visitors can bike west, stop to hike at Hanging Lake, and return to Glenwood Springs. Working with Drake and others, H2O was able to create a system so that those who want the bike adventure to Hanging Lake can purchase the reservation and the bike rental at the same time, through one of the vendors’ websites, either Canyon Bikes, Sunlight Ski and Bike, or Glenwood Adventure Co.
H2O and the government stakeholders have promised to keep the financials transparent and re-evaluate the pricing and overall program at the end of each peak season.